Moving far beyond the capabilities of traditional oligonucleotide synthesis, the advent of advanced synthesis technologies is enabling genetic constructs to be made more rapidly, accurately, affordably, and design friendly. Constructs ranging from simple and complex genes to pathways encompassing genes and genetic motifs longer than 10 kb can now be made along with complex cDNA and DNA libraries that incorporate advanced protein-engineering design. With more than 50% of post-1999 FDA-approved drugs being proteins or molecules that interact with proteins, these new advantages and competencies make the broader application of synthetic constructs in drug discovery possible. Such applications can expand experimental design, offering more informative results and higher degrees of success. Codon Devices’ (www.codondevices.com) BioFAB® and BioLOGIC™ technologies form the basis of a synthesis and engineering service that enables drug developers to apply this new potential. Antibody therapeutics are the most rapidly growing class of human therapeutics today. Because of their specificity and pharmacological properties, antibody-based therapeutics are showing potential for being more effective and safer than existing small molecules in the treatment of many diseases. 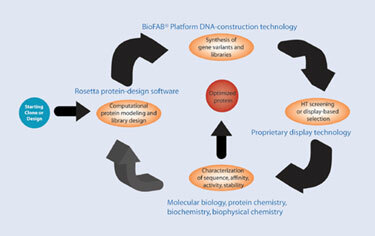 The BioLOGIC approach (Figure 1) assists with the development of antibody-based therapeutics through the use of computational modeling and library design, construction of high-fidelity libraries, and high-throughput selection. Computational modeling and library design: A DNA library contains a collection of closely related DNA constructs coding for variations of a protein to be engineered—an antibody in this example. Using advanced predictive software, the approach can use antibody-antigen crystal structures or homology models to predict mutations that would most likely enhance the desired property of the antibody, typically affinity. This technology enables a protein engineer to rationally design a library that would most likely contain a desired mutant. High-throughput selection: The Biotin Mediated Display (BMD) system, a form of yeast display, can screen libraries up to 108 clones for mutants that bind to a disease marker or antigen. 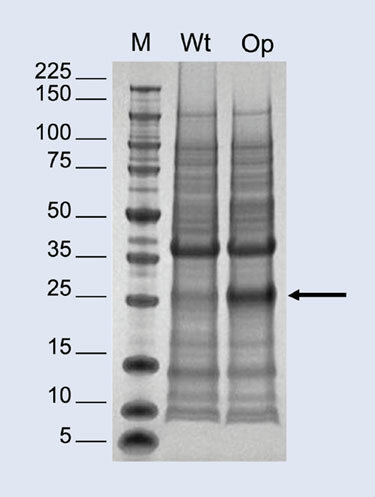 In addition to other classes of proteins, BMD is capable of displaying an intact, full-length antibody instead of antibody fragment, saving time and guaranteeing the binding fidelity of the final full-length form. BMD enables the quick transition from surface displayed protein to a soluble form, cutting assay and characterization times. Use of the BioLOGIC platform for pathway engineering aims to apply a more efficient process to the design and construction of biological machinery used in the biosynthesis of natural products in a desired host microorganism. Exploiting library construction and long-DNA synthesis capabilities, this approach applies the library concept to pathway engineering, where biosynthesis pathways are designed and constructed to include diversified genes and expression elements. Applications include the testing of multiple promoters, terminators, genes from different families, gene order, codon optimization, and message half-life. Conventional approaches to pathway engineering generally involve construction and testing of individual pathway variants in a serial and time-consuming process. In addition, the poor availability of well-characterized expression-control elements limits the ability to effectively sample expression space. Codon Devices’ process uses advanced technology for the design, synthesis, and reuse of functional elements across multiple pathways, reducing the cost and time involved in pathway optimization. De novo synthesis of multikilobase pathways enables complete codon remapping for optimized expression of pathway components in the chosen host organism and allows the introduction of native or engineered elements for expression modulation and control. Instead of serial construction and testing of a pathway, many versions can be constructed in parallel to create a pool of variant pathways with defined diversity. The pool can then be tested in parallel to screen or select for more efficient production of the desired natural product. 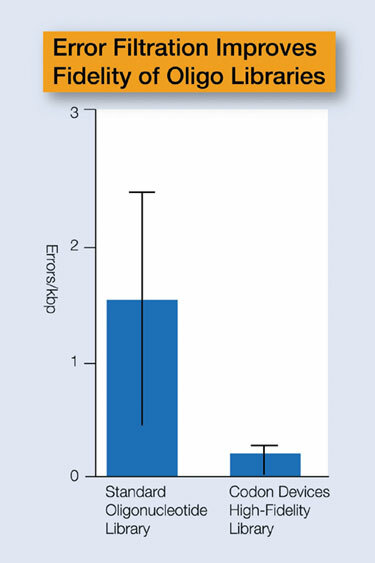 Codon optimization is designed to improve gene expression in the host system. Codon Devices’ algorithms compare the codons in the native sequence to the codon usage table for the planned host organism. Codons are scored using a codon-adaptation index (CAI), giving the relative frequency of a codon in an organism for a particular amino acid. The most frequent codon is assigned a value of 1.0; all others are normalized to that value. The algorithm seeks to avoid using rare codons to prevent downstream translational stalling and underexpression of the coded protein. Codons marked as rare are targeted for replacement with higher frequency codons. Other codons may be changed to impart desirable sequence characteristics or eliminate direct and inverted repeats that can interfere with assembly of the sequence, destabilize the construct during growth in the target organism, reduce mRNA stability, and/or interfere with translation of the mRNA. The algorithms work to balance the CAI rather than a typical approach of maximizing the CAI. This balancing uses nonrare codons in a frequency corresponding to its CAI. The use of algorithms that simply maximize the CAI can cause problems due to the overuse of specific codons, which could trigger the very phenomenon (tRNA depletions) that codon optimization is intended to avoid (Figure 3).